1) Social signaling as seen on this page. 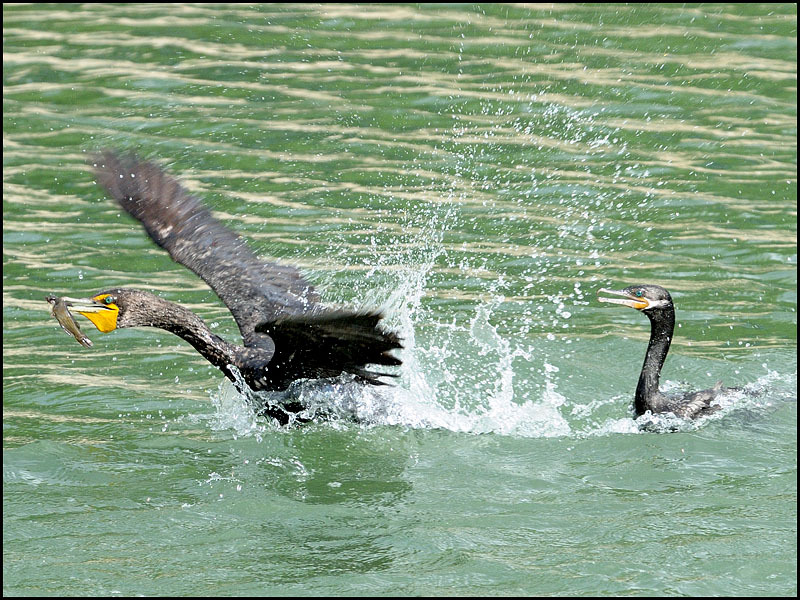 2) Courtship/Breeding as seen here. 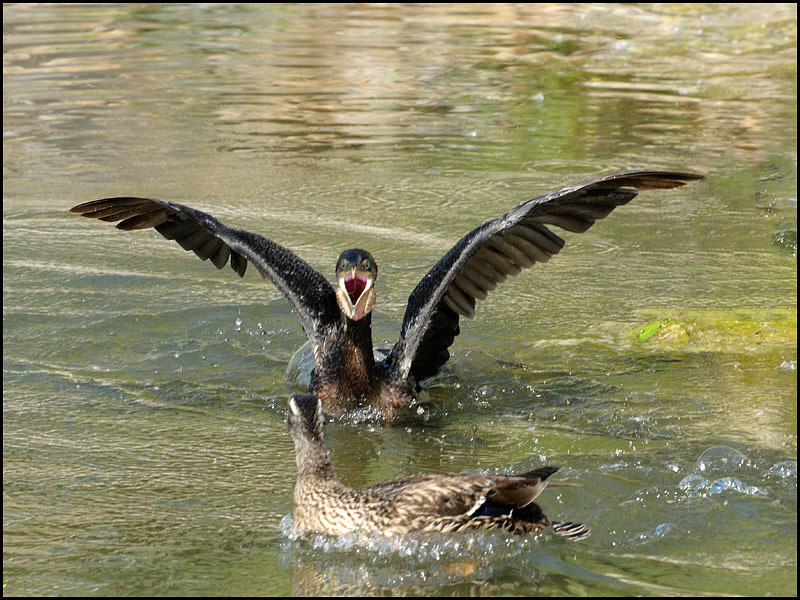 3) "Gular flutter" (Thermo-regulation of body heat) as seen here. 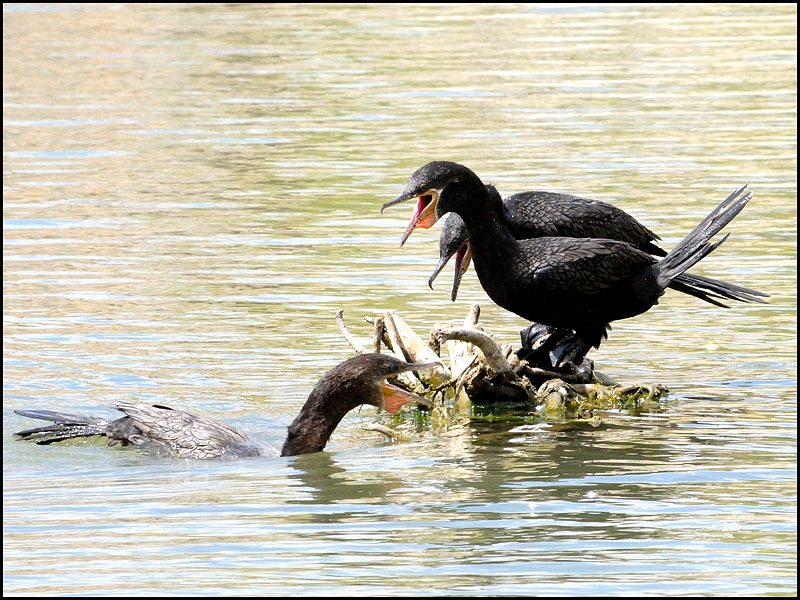 a) What you're about to see regarding Gular Sacs on NEOTROPIC CORMORANTS in Utah is, I believe, a new observation, having researched the literature to no avail. 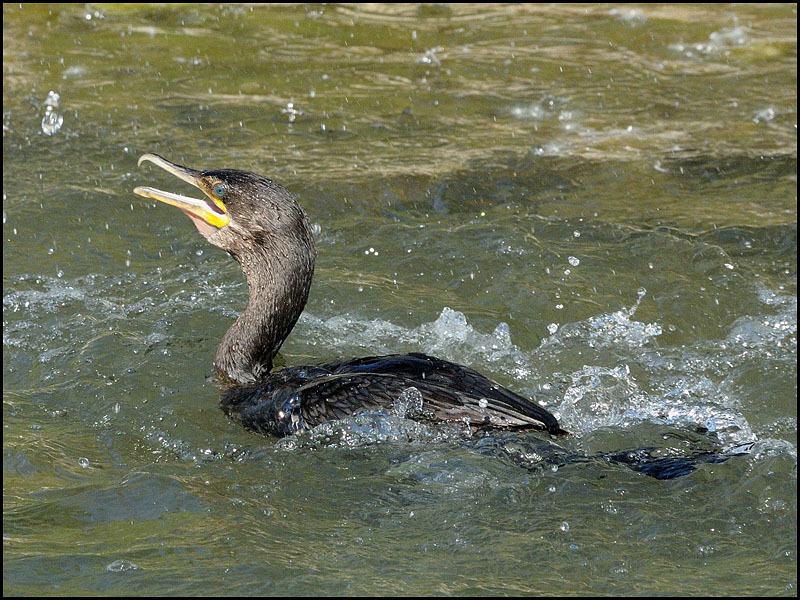 b) I postulate that Neotropic Cormorant Gular sac coloration/morphology represent NECO SPECIES CHARACTERISTICS, likely unpublished until now. c) Further, I believe the characteristic pink gular sac coloration/morphology can be used as a tool for positive I.D. 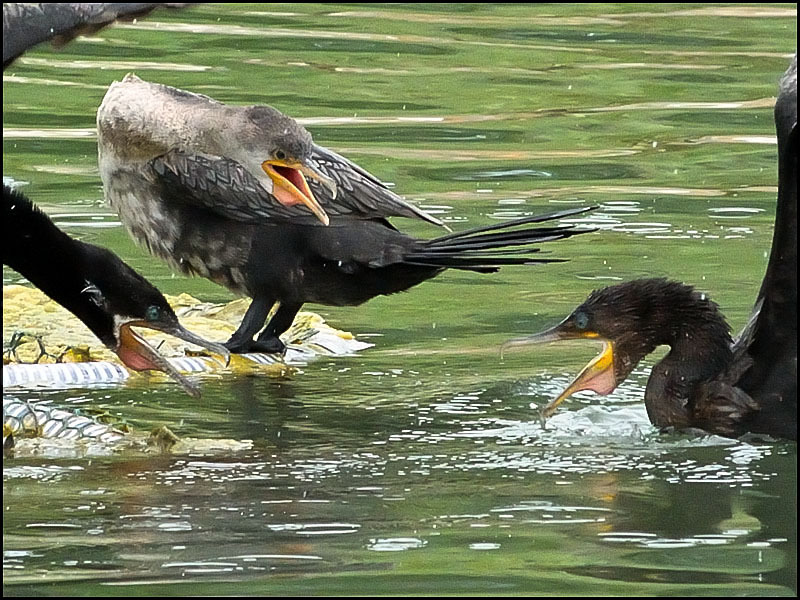 of Juvenile Neotropic Cormorants if conditions permit. 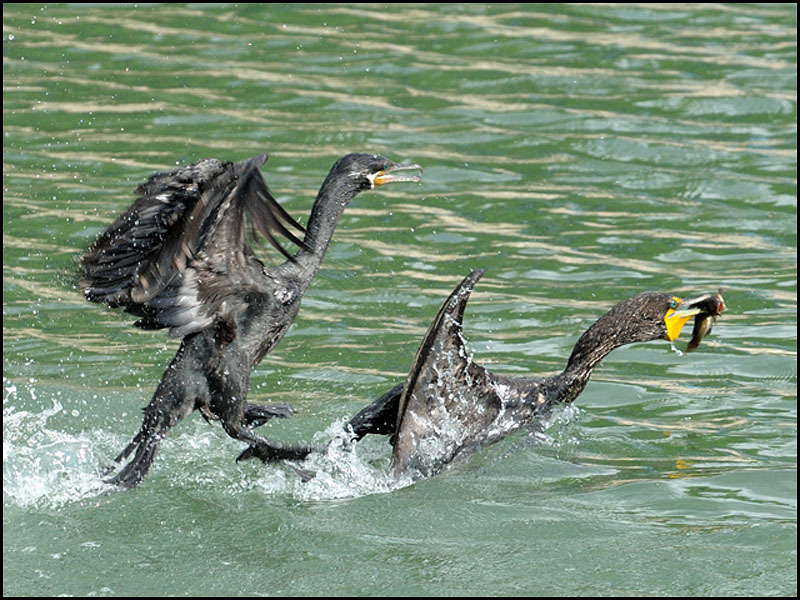 From April 18 through October 18, 2010, I amassed over 200 hours of observation/photography of Neotropic (Sight Record) and Double Crested Cormorants. 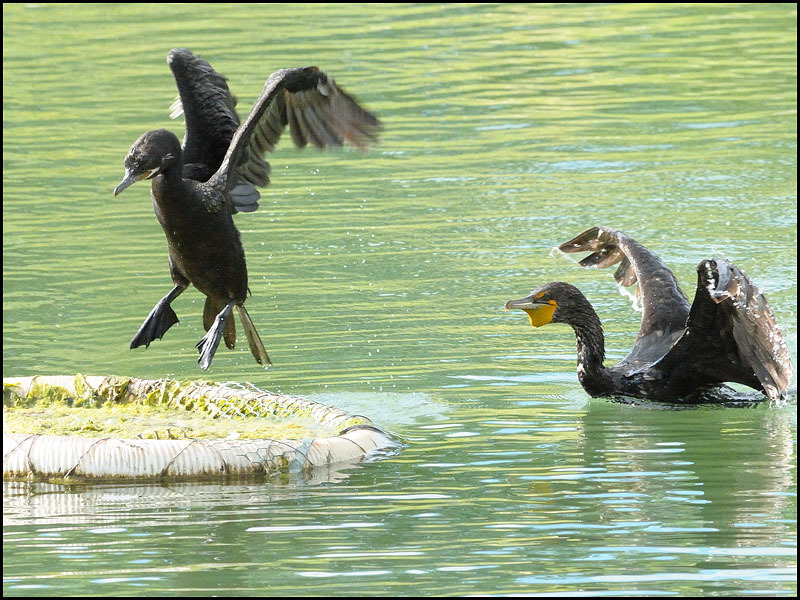 This was done mostly at Mill Race Pond, near the Jordan River, in Taylorsville, Utah. 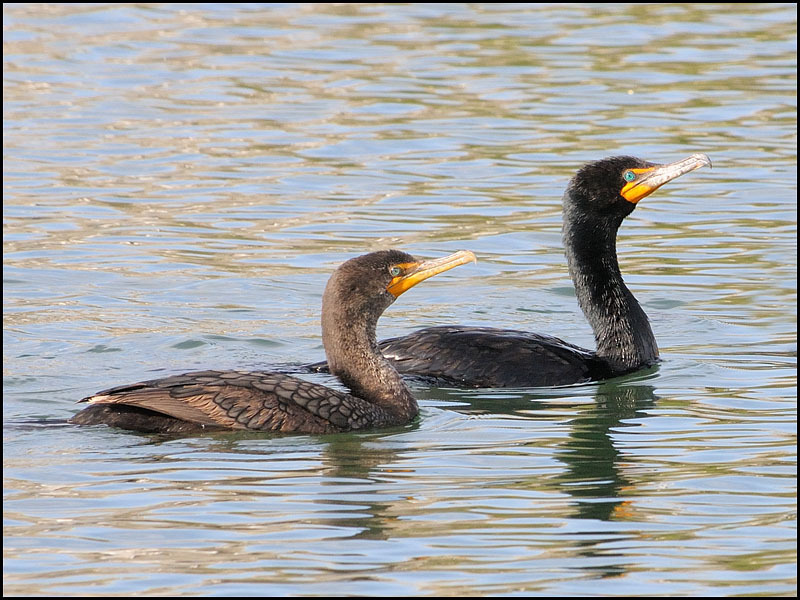 Each visit to the site produced anywhere from 2 to 7 Neotropic Cormorants, along with varying numbers of Double Crested Cormorants. 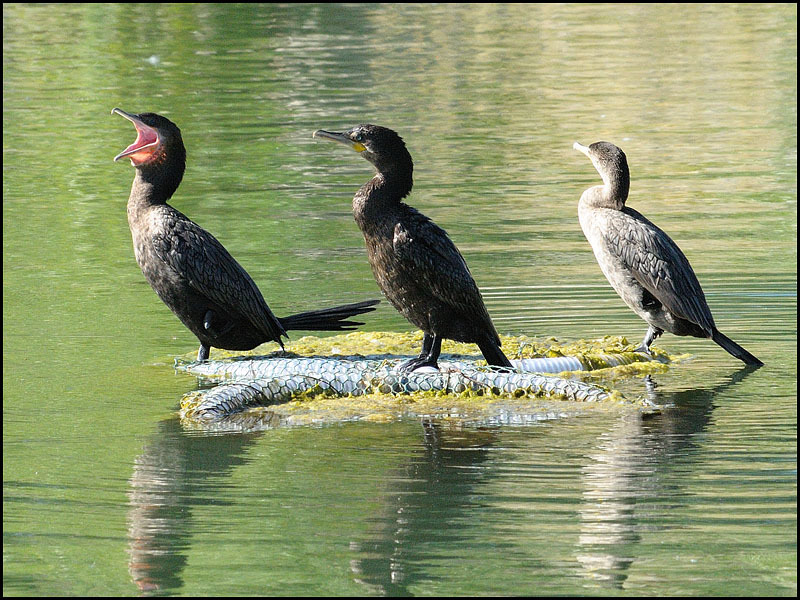 Neotropic Cormorants are classified as "Accidental" in Utah, wheras Double Crested Cormorants are considered "Native" to Utah (Summer). 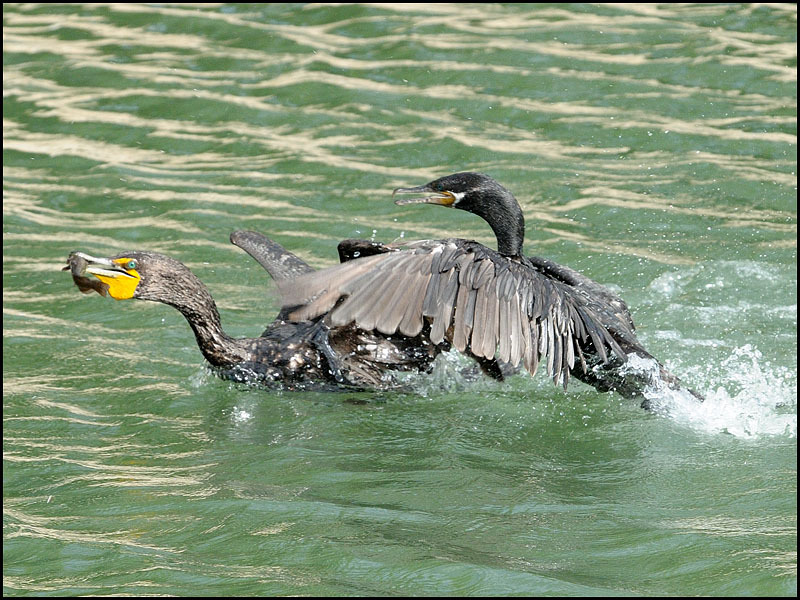 Juvenile Neotropic Cormorants (NECOs) are reported to be difficult to distinguish from juvenile Double Crested Cormorants (DCCOs). It has been generally believed that Juvenile NECOs have no yellow coloration in their lores (space between the eye and upper edge of the bill). Conversely, DCCOs have yellow lores associated with a patch of skin in the same area. The claim: "Juvenile NECOs never have yellow lores" has been disputed (Cin-Ty Lee pdf); and coincidently, data presented here may shed additional light as to the accuracy of that claim. Even when engaged in fighting, DCCOs often do not display their gular sacs. 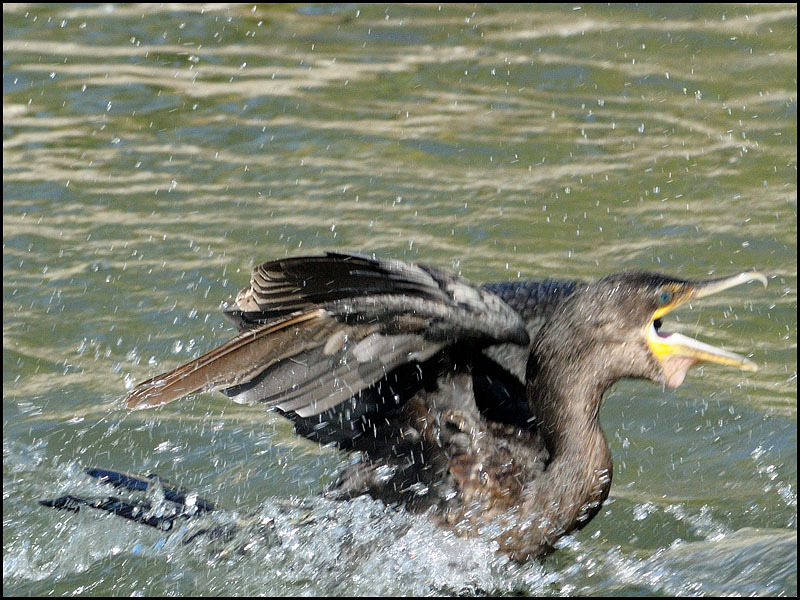 Neotropic Cormorant to move on. Turnabout is fair play! 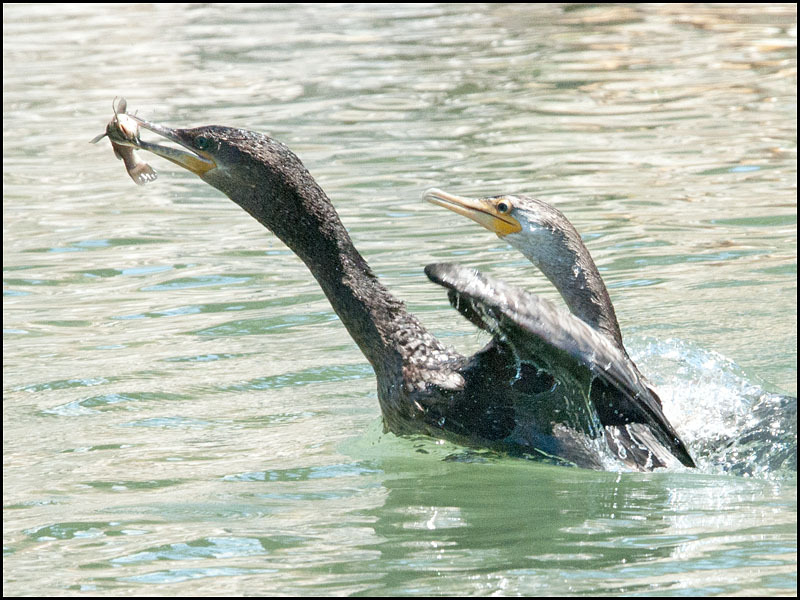 On another day, a NECO (Adult/breeding plumage) attempts to steal a fish from a DCCO, with the DCCO flourishing its gular sac big time! Here is another view of the action as the NECO becomes the marauder! 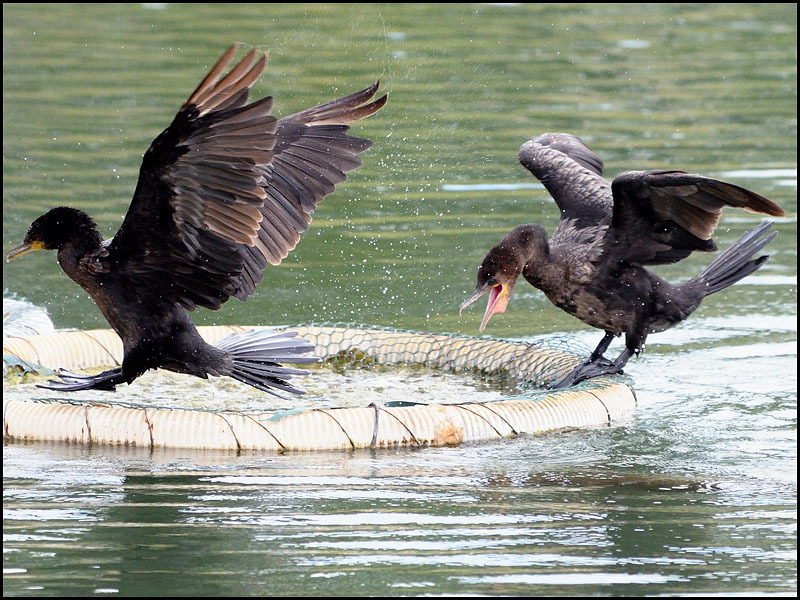 Finally the NECO takes flight for one last attempt to grab the fish from the DCCO. Now we've seen the gular sac on a DCCO, let's take a look at what the NECO's expanded gular sac looks like! 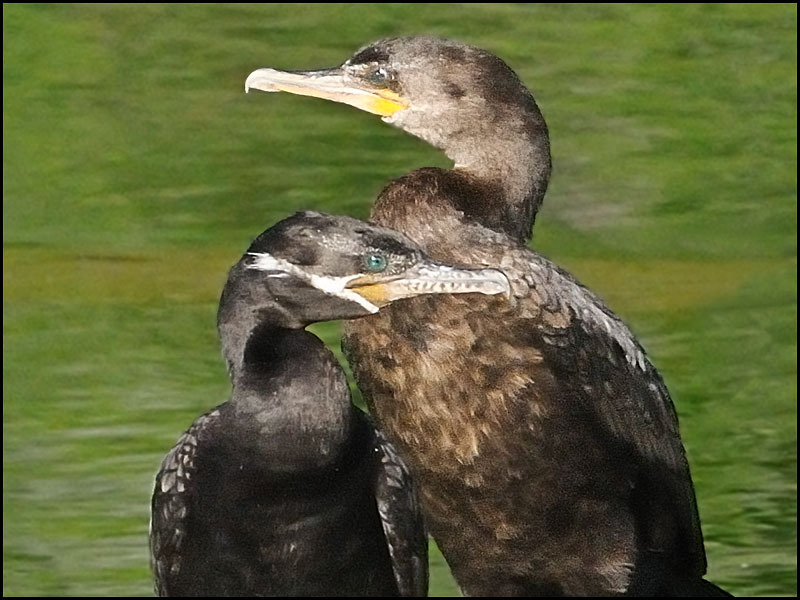 Below are 2 NECOs, with gular sacs hidden. This group of NECOs vary in age. 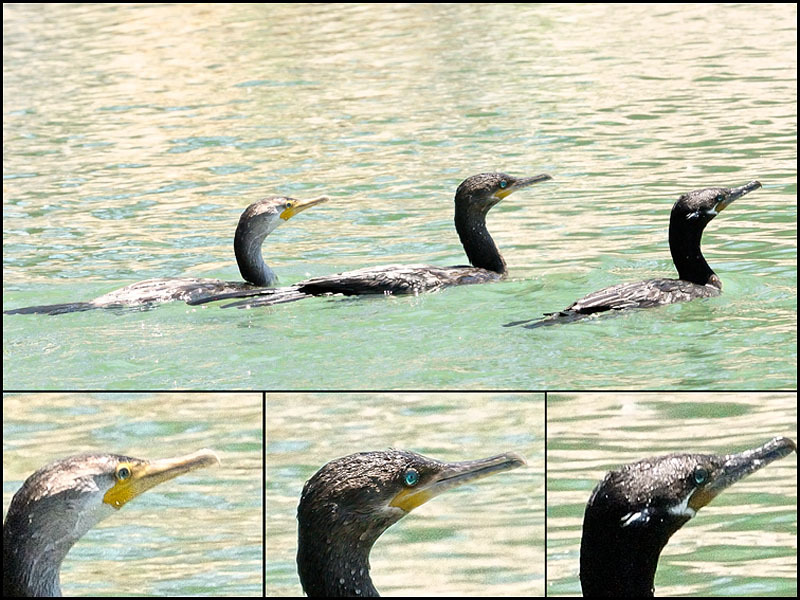 All of them possess PINK gular sacs as seen at the left. 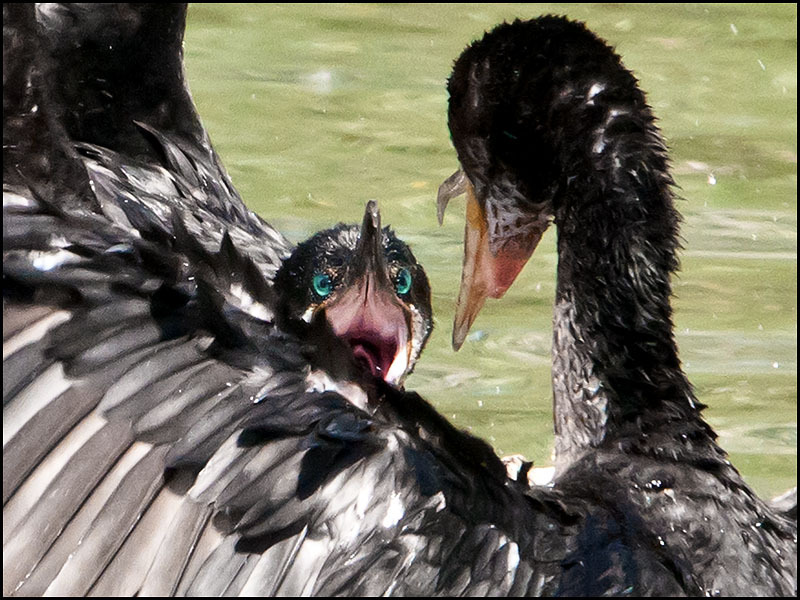 The NECO on the right displays its PINK GULAR SAC during a chaotic moment. 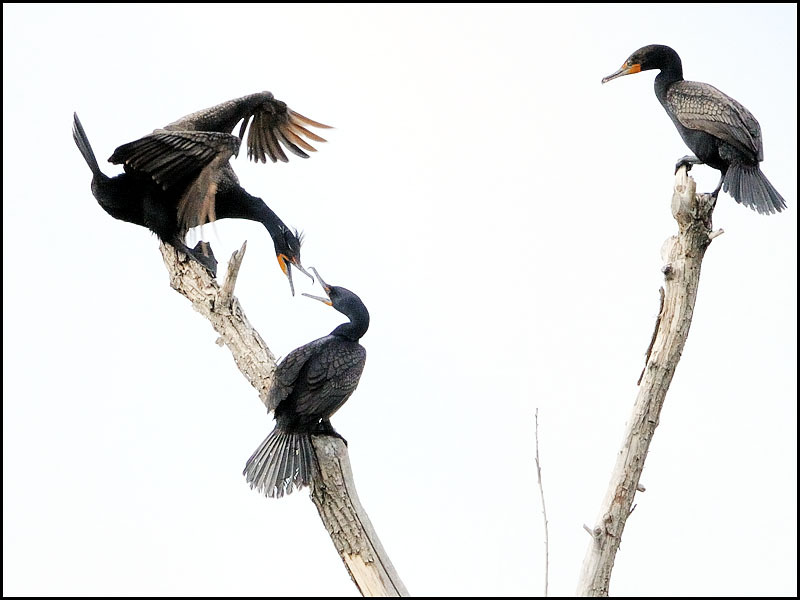 Two perched NECOs, signaling for a 3rd in the water to depart, with visual and vocal resistance from the 3rd NECO. Note the PINK gular sacs! 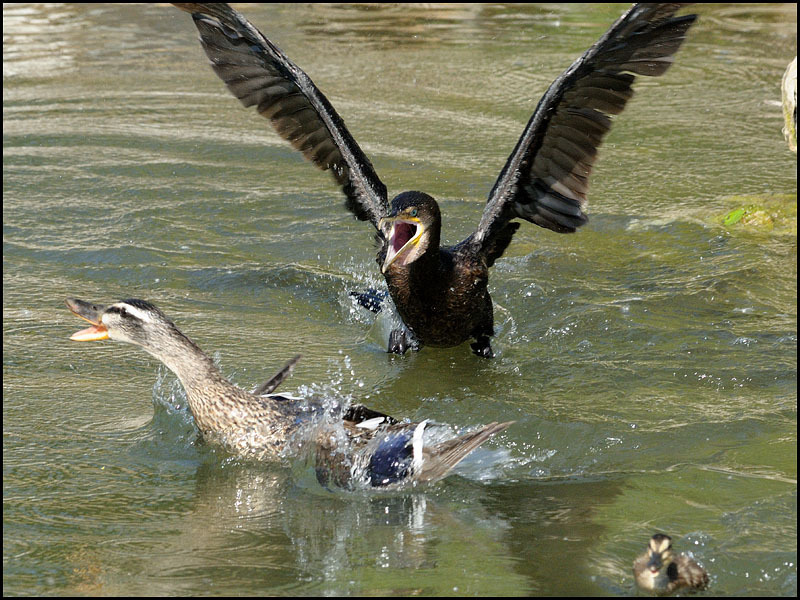 The female Mallard has ducklings, thus tries to defend herself. The Mallard 'holds her own' with the fierce NECO! 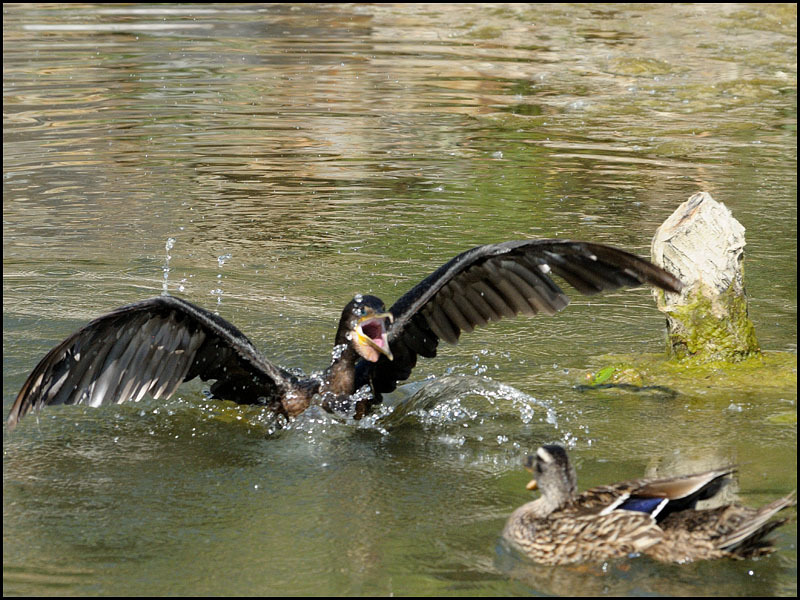 Things get heated up and the Mallard and babies scatter! 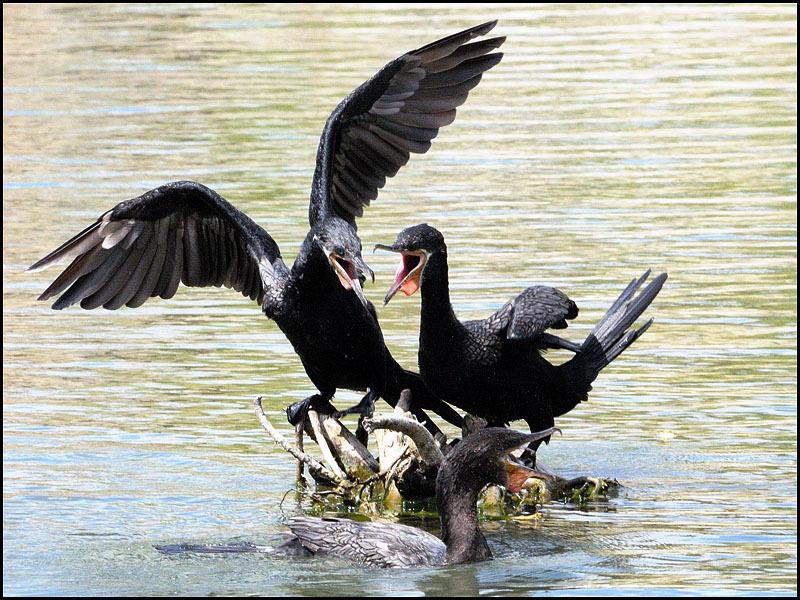 Here we see 3 Adult (breeding plumage) NECOs hassling over real estate. The 2 perched NECOs succeed in warding off the third individual, all displaying their unique PINK gular sacs. L) Juvenile NECO that could be confused with a Juvenile DCCO! Notice the Yellow Lores on this bird! C) Adult NECO.. No yellow in the Lores. (NOTE: If the Juvenile is a DCCO, it will display a YELLOW/ORANGE gular sac. This additional photo shows 2 of the same birds again. NOTICE, THE JUVENILE LOOKS SOMEWHAT LIKE A DCCO! 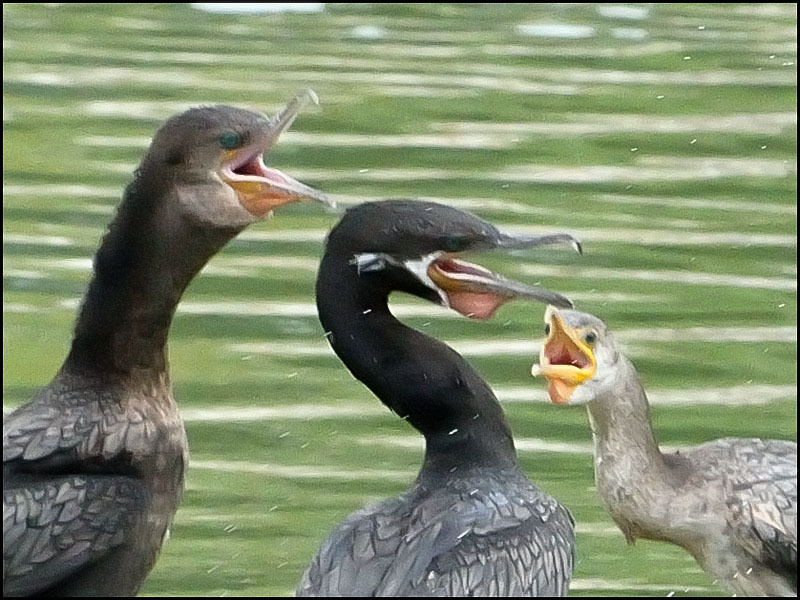 HERE ARE THE SAME 3 BIRDS, DISPLAYING THEIR GULAR SACS. ALL 3 BIRDS MANIFEST PINK GULAR SACS!! THE JUVENILE IS A NECO! 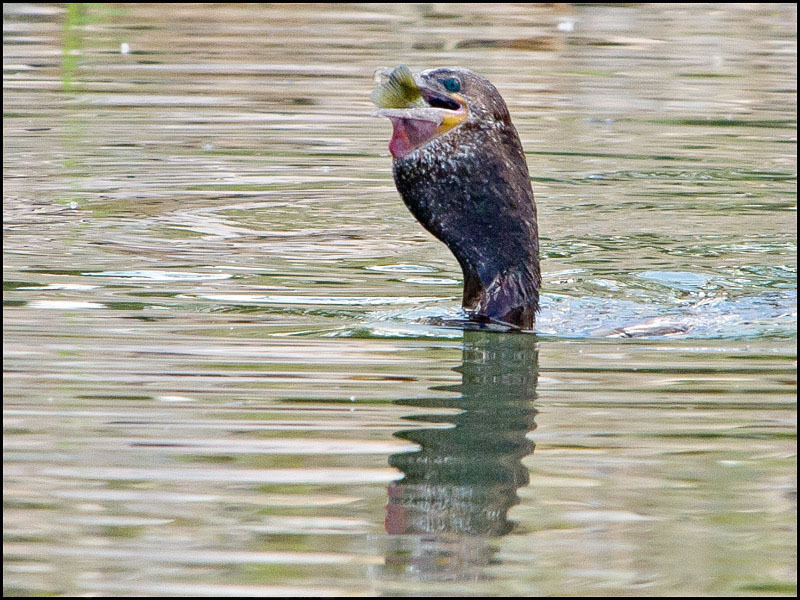 "They can be distinguished from other Cormorants by a white outline around the gular pouch and base of the bill. 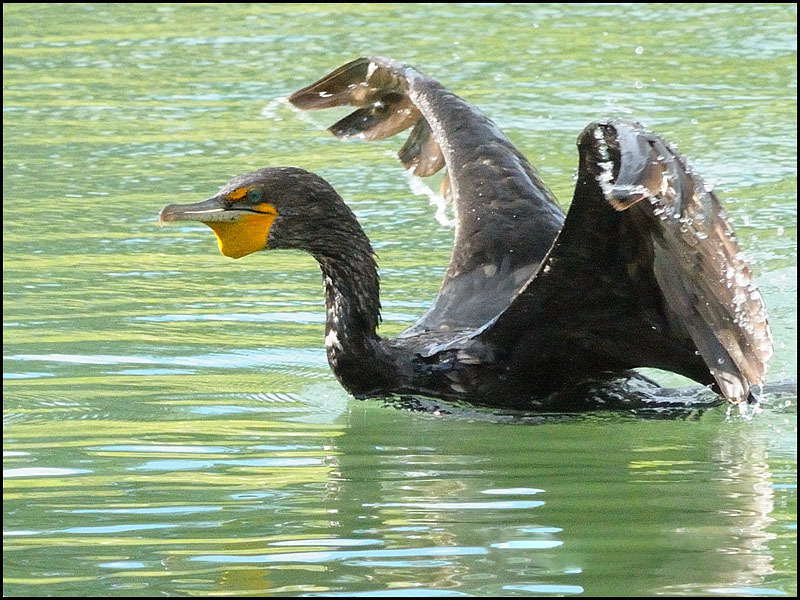 The gular pouch appears triangular rather than rounded as in Double Crested Cormorants. IF THE GULAR SAC IS EXTENDED IT WILL BE OBSERVED TO BE PINK, WHICH IS A UNIQUE CHARACTERISTIC WITHIN THE SPECIES." Again, notice the pink gular sac! This concludes section 1) "Social Signaling"
Section 2) "Courtship" can be found here. Section 3) "Gular Flutter" can be found here. Copyright ©2009 Rich B Young.